Sunset Beach put it’s best face forward for nearly the entire second leg of the Vans Triple Crown, so much so that many are calling this one of the all-time great events ever held at Sunset. As amazing as the conditions were throughout, the performances unleashed by the competitors were even more remarkable. And while guys like Jordy Smith, Dusty Payne, Tom Whitaker, and Joel Parkinson surfed the burly right-hander with as much style, power, and grace as humanly possible, it was the performance of goofy-foot surfer C.J. Hobgood that ended up standing above all as the 2001 ASP world champion pulled out an unexpected victory yesterday on his way to winning the O’Neill World Cup of Surfing. Congratulation’s C.J. Hobgood, winner of the 2008 O’Neill World Cup of Surfing at Sunset Beach! 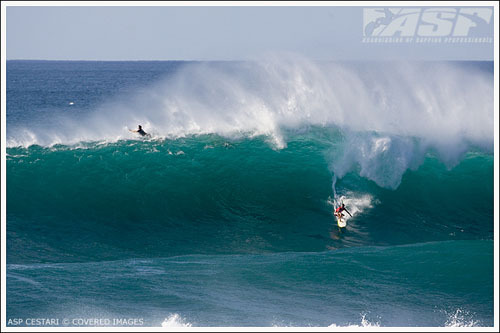 Posted by Shaun	on Friday, December 5th, 2008	in Surfing.